Forecasts of hurricane activity are issued before each hurricane season by noted hurricane experts such as Dr. William M. Gray and his associates at Colorado State University (CSU). A normal season as defined by the National Oceanic and Atmospheric Administration (NOAA), has eleven named storms, of which six reach hurricane strength, and two major hurricanes. The May 1997 forecast stated that eleven storms would form and that seven would reach hurricane status. In addition, it was predicted that three of the seven hurricanes would intensify into a major hurricane – a Category 3 rating on the Saffir–Simpson Hurricane Scale. The Atlantic hurricane season officially began on June 1, and an unnamed subtropical storm developed on the same day. 1997 was the least active hurricane season in above average era of tropical cyclogenesis, which began in 1995. Only nine tropical depressions formed. Eight of the depressions attained tropical storm status, and just three of these attained hurricane status. There was only one tropical cyclone to reach major hurricane status, which was slightly below the 1950–2005 average of two per season. Only Danny made landfall at hurricane strength during the season, although Hurricane Erika and Tropical Storm Grace also caused damage and fatalities. Those three cyclones collectively caused 11 deaths and $111.46 million in damage. The last storm of the season, Tropical Storm Grace, dissipated on October 17, over a month before the official end of the season on November 30. 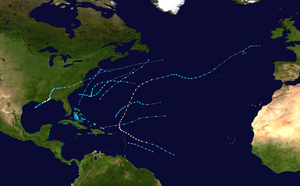 The 1997 Atlantic hurricane season had a very active beginning. In June, two tropical cyclones developed – the unnoticed subtropical storm and Tropical Storm Ana. An unusual four tropical cyclones formed in the month of July, three of which reached tropical storm intensity, and two of them became hurricanes. Despite the active start, the other months of the season featured record low activity, especially in August and September, both of which combined produced only one tropical cyclone. As a result of the active start and subsequent lack of activity, it showed that early season activity has no correlation to the entire season. The lone tropical cyclone during the period was Hurricane Erika, which developed on September 3. In October, two short-lived tropical cyclones developed, Fabian and Grace. Tropical cyclogenesis ceased after Grace transitioned into an extratropical cyclone on October 17. The season's activity was reflected with a low accumulated cyclone energy (ACE) rating of 41. ACE is, broadly speaking, a measure of the power of the hurricane multiplied by the length of time it existed, so storms that last a long time, as well as particularly strong hurricanes, have high ACEs. ACE is only calculated for full advisories on tropical systems at or exceeding 34 knots (39 mph, 63 km/h) or tropical storm strength. Although officially, subtropical cyclones, such as the unnamed storm, are excluded from the total, the figure above includes periods when storms were in a subtropical phase. A cluster of thunderstorms developed over Florida in late May. A shortwave trough brought it to the northeast, enhancing convection around a developing center of circulation. The low pressure area, which formed on May 31, developed into a subtropical depression on June 1. Operationally, it was treated as a frontal low, but post-analysis suggested it remained separate throughout its lifetime, and was classified as an unnamed subtropical storm. It reached subtropical storm strength six hours later as it moved rapidly parallel to the East Coast of the United States. The convection continued to wrap around the center, and despite unfavorable conditions from an approaching cold front it continued to intensify. Late on June 1, it reached its peak intensity with maximum sustained winds of 50 mph (85 km/h) while off the coast of North Carolina. The storm turned to the east, and transitioned extratropical late on June 2 southeast of Massachusetts. Shortly thereafter, the remnants of the storm merged with a cold front. A frontal low pressure system off the coast of South Carolina developed into Tropical Depression One at 1200 UTC on June 30. It moved slowly eastward, and attained tropical storm status on July 1. After becoming a tropical storm, Ana slightly intensified. Early on July 2, Ana attained its peak intensity with maximum sustained winds of 50 mph (85 km/h) and a minimum central pressure of 1,000 mbar (30 inHg). Later on July 2, a shortwave trough forced Ana to northeastward, into a region of increasing vertical wind shear. Simultaneously, Ana began to weaken, as it was moving into an area of decreasing sea surface temperatures (SST). By late on July 3, Ana weakened to a tropical depression. The storm also lost tropical characteristics and transitioned into an extratropical cyclone early on July 4, over the western Atlantic Ocean. The extratropical remnants persisted until dissipating about twenty-four hours later. Minimal impact was reported as a result of Ana, other than rip currents in coastal North Carolina. Due to the rough seas, 14 rescues and one serious injury occurred at Carolina Beach. In addition, five rescues were made at Kure Beach and at least one person was hospitalized. However, there were no fatalities at either location. A large upper-level low separated from a trough north of Puerto Rico in early July. Convection increased on July 7 after a surface trough developed, and a low pressure area formed east of the Bahamas once the upper-level low retreated to the southwest. Wind shear decreased across the region, allowing the convection to increase and organize, and it is estimated the system developed into a tropical depression on July 11 about 330 miles (530 km) southwest of Bermuda. After developing, the cyclone moved northeastward in advance of an approaching cold front. It quickly intensified into Tropical Storm Bill, and briefly threatened to pass near Bermuda. As a result, a tropical storm warning was issued, although it was quickly dropped; there was no impact on the island from Bill. Bill quickly intensified as it continued northeastward. By midday on July 12, an eye feature was observed on satellite images, which suggested that Bill intensified into hurricane status at a relatively high latitude. Bill had in fact intensified into a hurricane, and the storm had attained its peak intensity with maximum sustained winds of 75 mph (120 km/h) minimum pressure of 986 mbar (29.1 inHg). After only 12 hours at hurricane status, Bill weakened back to tropical storm status, and on July 13 was absorbed by the cold front about 185 miles (298 km) south of Cape Race, Newfoundland. Bill dropped very light rainfall on Newfoundland, peaking at slightly less than 1 inch (25 mm). The frontal system that influenced the track of Hurricane Bill spawned a non-tropical low off the southeast United States on July 11. The low remained nearly stationary as the front dissipated, and it developed into Tropical Depression Three on July 13 about 325 miles (523 km) south-southeast of Wilmington, North Carolina. The depression quickly intensified into Tropical Storm Claudette, based on reconnaissance aircraft data. It moved northeastward, passing southeast of the Outer Banks. Despite the presence of wind shear it developed banding features. On July 14, the storm reached peak winds of 45 mph (72 km/h). Thereafter, Claudette turned eastward ahead of a frontal system. Its associated thunderstorm activity was sporadic and relatively disorganized, and the storm weakened to a tropical depression on July 16. Claudette briefly re-intensified into a tropical storm before becoming extratropical later that day. Shortly thereafter, it merged with a cold front, while the remnants were last noted near the Azores on July 23. Tropical Storm Claudette had minimal effects on land. Severe rip currents from Claudette in North Carolina caused several rescues and one person was injured, although no fatalities occurred. Some residents of coastal North Carolina were even disappointed that Claudette was to remain offshore, as the region was suffering from dry conditions. A tropical low over the northern Gulf of Mexico developed into Tropical Depression Four on July 16. The depression headed slowly east-northeastward, and intensified into Tropical Storm Danny on the following day. Danny continued east-northeastward, and reached hurricane strength just before landfall near Buras, Louisiana. Because of the narrowness of that piece of land, most of Danny remained over water and it lost little strength. Danny re-emerged into the Gulf of Mexico, and strengthened slightly making two landfalls in Alabama as a low-end Category 1 hurricane on July 19. After remaining stationary for a day, Danny moved northward and weakened to a tropical depression. Heading northward across Alabama, Danny turned to the east and crossed over the Southeastern United States. While centered over North Carolina, Danny interacted with a developing trough, which caused it to re-intensify into a tropical storm. Shortly thereafter, Danny emerged over the Atlantic Ocean near the North Carolina/Virginia border on July 24. Danny took a northward turn, and came within 30 mi (48 km) of Nantucket Island on July 26. It then turned out to sea and was absorbed by a front on July 27. Although Danny was a hurricane upon landfall, strong winds were confined to a small area, with only portions of extreme eastern Louisiana reporting hurricane-force winds. Danny also dropped torrential amounts of rain in Louisiana, peaking at 11.40 in (290 mm) in Buras-Triumph. Flooding occurred in portions of the state due to heavy rainfall. The floods and high winds produced by Danny damaged over 300 houses and more than 170 businesses in Louisiana alone. In Mississippi, Danny dropped heavy rainfall on the southern portion of the state, resulting in minor street and house flooding. As Danny crossed Dauphin Island, Alabama on July 19, it dropped 37.75 inches (959 mm) of rain. This made Danny the wettest tropical cyclone on record in Alabama. Hurricane force-winds were reported on Dauphin Island and the western shores of Mobile Bay. In the same area, many buildings had sustained roof damage. In addition, many homes on the Fowl and Fish Rivers reported significant damage. Further north in South Carolina and Virginia, Danny spawned several tornadoes; some of them caused significant damage. Heavy rainfall also occurred in some isolated areas; in central North Carolina between 8–12 inches (200–300 mm) of rain was reported. Danny eventually affected Massachusetts, bring light rainfall and tropical storm-force winds to the southeastern portions of the state. Overall, Danny caused nine fatalities, and approximately $100 million in damage. A tropical wave emerged into the Atlantic Ocean from the west coast of Africa on July 11. The wave moved westward across the tropical Atlantic, and finally began to show consistent evidence of a cloud system center. Deep convection associated with the wave became concentrated on satellite images on July 17, and it is estimated that the disturbance became Tropical Depression Five around 0600 UTC on that day while centered about 547 miles (880 km) east of Barbados. The tropical depression moved west-northwestward and started showing signs of falling apart on July 18. Early on the following day, the depression degenerated into a tropical wave. Recon observations before the storm fell apart suggested that it may have briefly reached tropical storm strength. The tropical wave continued westward without regenerating and lost its identity on July 23 over the eastern Gulf of Mexico. A tropical wave, which would later also develop Hurricane Nora, developed into Tropical Depression Six while it was centered about 1,150 miles (1,850 km) east of the southernmost Lesser Antilles on September 3. Later that day, the depression intensified enough to be upgraded to Tropical Storm Erika. It moved west-northwestward and steadily intensified to attain hurricane status on September 4. Erika passed a short distance to the north of the Lesser Antilles, and later turned to the north in response to an approaching trough. The hurricane quickly strengthen to reach peak winds of 125 mph (195 km/h) on September 8, and after maintaining peak strength for 24 hours Erika weakened over cooler waters. It turned to the east, weakened to a tropical storm, and became extratropical after passing near the Azores on September 15. The hurricane produced light rainfall and winds throughout the northern Lesser Antilles. The passage of Erika brought a cloud of ash to Antigua from the eruption of the Soufrière Hills Volcano on Montserrat, a rare occurrence. Strong waves from the hurricane produced beach erosion and coastal flooding in northern Puerto Rico, and killed two surfers. Moderate wind gusts in Puerto Rico left thousands without power, and the hurricane resulted in $10 million in damage to the Caribbean territory of the United States. Erika also produced gusty winds and light rain in the Azores. Later in its duration, the storm brought hurricane-force wind gusts and rainfall to the Azores, though no damage was reported. Erika was the only tropical cyclone in the Atlantic basin in the month of September in this year, the first such occurrence in a hurricane season since 1929. A tropical wave emerged into the Atlantic Ocean from the west coast of Africa near Dakar, Senegal on September 22. The wave traveled westward with minimal tropical cyclogenesis and reached the Lesser Antilles about a week later. While passing through the islands, heavy rainfall and strong winds were reported. Eventually, the system developed into a broad area of low pressure and acquired a low-level circulation. However, upper-level wind shear resulted in no immediate further organization. After crossing Puerto Rico and the Virgin Islands, wind shear decreased, since the low was moving in the same direction as the upper-level winds. At 1800 UTC October 4, it is estimated that system developed into Tropical Depression Seven, while 410 miles (660 km) north of Puerto Rico. However, the National Hurricane Center did not initiate advisories until 1500 UTC on October 7. The depression strengthened and about 24 hours after forming, it became Tropical Storm Fabian later on October 5. No further significant change in intensity occurred for the remainder of its duration, as Fabian had peaked with winds of 40 mph (65 km/h). The storm began losing tropical characteristics and transitioned into an extratropical cyclone at 1200 UTC on October 8. An extratropical low formed just north of Hispaniola on October 14, and on the following day, it attained gale-force winds. In addition, the system was also acquiring tropical characteristics, and was classified as Tropical Storm Grace on October 16 at 0000 UTC. Strong vertical wind shear prevented further intensification, and Grace immediately peaked with maximum sustained winds of 45 mph (75 km/h) and a minimum barometric pressure of 999 mbar (29.5 inHg). Though Grace was classified as a tropical cyclone, it still held onto some extratropical characteristics. Thereafter, Grace steadily weakened and eventually degenerated into an extratropical low on October 17. The precursor disturbance of Grace dropped moderate to heavy rainfall across Puerto Rico, peaking at 12.69 inches (322 mm) in Aibonito. As a result, flash flooding occurred throughout the island of Puerto Rico, while landslides caused damage to roads and bridges. In addition, numerous rivers overflowed their banks, which forced 37 people to seek shelter across the island. One fatality occurred, and damage amounted to $1.46 million. In addition, the extratropical system produced light to moderate rainfall in the U.S. Virgin Islands, and precipitation reached 7 inches (180 mm) along western sides of the islands. The following names were used for named storms that formed in the north Atlantic in 1997. In the spring of 1998, no names were retired, so it was used again in the 2003 season. This is the same list used for the 1991 season except for Bill, which replaced Bob. A storm was named Bill for the first time in 1997. Names that were not assigned are marked in gray. This is a table of all of the storms that formed in the 1997 Atlantic hurricane season. It includes their duration, names, landfall(s) – denoted by bold location names – damages, and death totals. Deaths in parentheses are additional and indirect (an example of an indirect death would be a traffic accident), but are still related to that storm. Damage and deaths include totals while the storm was extratropical or a wave or low, and all of the damage figures are in 1997 USD. ^ Neal Dorst (January 21, 2010). Subject: G1) When is hurricane season ? (Report). National Oceanic and Atmospheric Administration. Archived from the original on April 24, 2011. Retrieved April 12, 2011. ^ a b c d "Hurricane Expert Predicts Active Season". WRAL-TV. May 30, 1997. Retrieved April 12, 2011. ^ a b National Oceanic and Atmospheric Administration (May 27, 2010). Background information: the North Atlantic hurricane season (Report). Climate Prediction Center. Archived from the original on May 10, 2011. Retrieved April 13, 2011. ^ a b c d Edward N. Rappaport (October 5, 1998). Atlantic Hurricane Season of 1997 (PDF) (Report). National Hurricane Center. Archived (PDF) from the original on May 25, 2011. Retrieved April 13, 2011. ^ a b c Richard J. Pasch (August 21, 1997). Hurricane Danny Preliminary Report (PDF) (Report). National Hurricane Center. Archived from the original on May 14, 2011. Retrieved April 13, 2011. ^ a b c d e Miles B. Lawrence (October 24, 1997). Hurricane Erika Tropical Cyclone Report (PDF) (Report). National Hurricane Center. Archived from the original on May 14, 2011. Retrieved May 11, 2011. ^ a b "Erika swipes Caribbean, hits Azores". USA Today. June 11, 1999. Archived from the original on May 11, 2011. Retrieved May 11, 2011. ^ Stuart Hinson (2019). NCDC Storm Event Database (Report). National Climatic Data Center. Archived from the original on May 5, 2011. Retrieved April 13, 2011. ^ Atlantic Oceanographic and Meteorological Laboratory (March 2011). Atlantic basin Comparison of Original and Revised HURDAT (Report). National Oceanic and Atmospheric Administration. Retrieved July 23, 2011. ^ David Levinson (August 20, 2008). 2005 Atlantic Ocean Tropical Cyclones (Report). National Climatic Data Center. Retrieved September 17, 2011. ^ Jack L. Beven; B. Max Mayfield (November 12, 1997). Unnumbered Subtropical Storm Preliminary Report (PDF) (Report). National Hurricane Center. Archived from the original on May 14, 2011. Retrieved April 12, 2011. ^ a b Miles B. Lawrence (August 4, 1997). Tropical Storm Ana Preliminary Report (PDF) (Report). National Hurricane Center. Archived from the original on May 14, 2011. Retrieved April 13, 2011. ^ a b Stephen Del Greco (July 1997). Storm Data And Unusual Weather Phenomena With Late Reports And Corrections (PDF) (Report). National Climatic Data Center. Archived from the original (PDF) on March 30, 2006. Retrieved July 14, 2011. ^ a b Lixion A. Avila (August 5, 1997). Hurricane Bill Preliminary Report (PDF) (Report). National Hurricane Center. Archived from the original on May 14, 2011. Retrieved April 12, 2011. ^ "1997-Bill". Environment Canada. September 14, 2010. Retrieved April 13, 2011. ^ a b Edward N. Rappaport (August 13, 1997). Tropical Storm Claudette Preliminary Report (PDF) (Report). National Hurricane Center. Retrieved September 17, 2011. ^ "Tropical Storm Claudette pushes north". Daily News. Reuters. July 14, 1997. Retrieved March 2, 2010. ^ Steve Stone (July 15, 1997). "Claudette- and all her rain – expected to remain out to sea". The Virginian-Pilot Archives. Retrieved September 20, 2011. ^ a b c "Hurricane Danny damage reports". USA Today. National Weather Service. June 11, 1999. ^ a b c David Roth (April 23, 2007). Hurricane Danny – July 14–28, 1997 (Report). Hydrometeorological Prediction Center. Retrieved September 20, 2011. 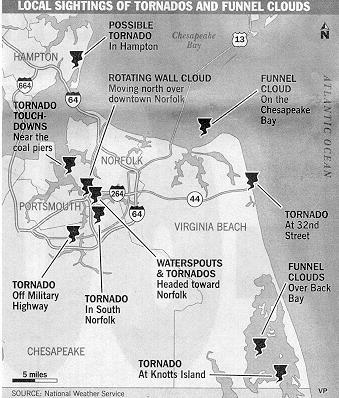 ^ "Local Sightings of Tornadoes and Funnel Clouds". Virginian Pilot. National Weather Service. 1997. Archived from the original on May 16, 2005. Retrieved September 20, 2011. ^ "Tropical Storm Danny Visits Portsmouth!". Portsmouth Weather Records Service. July 24, 1997. Archived from the original on October 22, 2002. Retrieved December 28, 2006. ^ B. Max Mayfield (July 28, 1997). Tropical Depression Five Preliminary Report (PDF) (Report). National Hurricane Center. Retrieved September 17, 2011. ^ National Climatic Data Center (1997). Event Report for Puerto Rico (Report). Archived from the original on May 11, 2011. Retrieved May 11, 2011. ^ Miles B. Lawrence (October 1, 1997). September Monthly Tropical Weather Summary (Report). National Hurricane Center. Archived from the original (TXT) on June 11, 2008. Retrieved May 11, 2011. ^ a b c Lixion A. Avila (October 28, 1997). Tropical Storm Fabian Preliminary Report (PDF) (Report). National Hurricane Center. Archived from the original on May 14, 2011. Retrieved May 11, 2011. ^ Gary Padgett. Monthly Global Tropical Cyclone Summary: October, 1997 (Report). Australian Severe Weather. Retrieved January 23, 2013. ^ Edward N. Rappaport (November 5, 1997). Tropical Storm Grace Preliminary Report (PDF) (Report). National Hurricane Center. Retrieved September 17, 2011. ^ a b David M. Roth (June 21, 2007). Formative stage of Grace – October 12–15, 1997 (Report). Hydrometeorological Prediction Center. Retrieved September 17, 2011. ^ Stuart Hinson (2011). "NCDC Storm Event Database". National Climatic Data Center. Archived from the original on April 24, 2007. Retrieved September 17, 2011. ^ a b "Names Are Listed For 1997 Hurricanes". New York Times. May 26, 1997. Retrieved September 17, 2011. ^ 2003 Atlantic Hurricane Names (Report). Louisiana Homeland Security. November 13, 2009. Archived from the original on March 26, 2012. Retrieved September 17, 2011. ^ Tropical Cyclone Naming History and Retired Names (Report). National Hurricane Center. September 9, 2011. Retrieved September 17, 2011. ^ Staff Writer (June 2, 1991). "Ana, Bob, Claudette first hurricane names". Portsmouth Daily Times. Retrieved September 17, 2011. Wikimedia Commons has media related to 1997 Atlantic hurricane season.